Epiphone Deluxe Model Arch Top Acoustic Guitar (1946), made in New York City, serial # 54661, natural lacquer finish, curly maple back and sides, spruce top; laminated maple neck with rosewood fingerboard, brown hard shell case. Original high-end acoustic arch-top Epiphone guitars are surprisingly hard to find today; this Deluxe model from 1946 is both a treat for the archtop enthusiast and an extremely fine player's instrument. 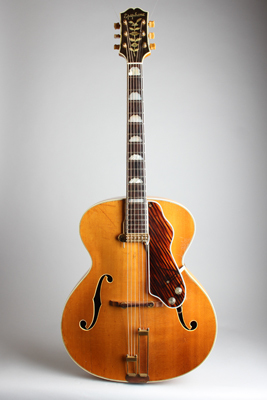 At the time this guitar was built, the Stathopoulo family still had their guitar building operation on the second floor of a large loft building on 14th street where Epiphone, Inc. Operated their factory/showroom in the heart of Swing-era New York. The Deluxe, along with the inch-larger and even fancier Emperor were among the very finest orchestral guitars available, along with the Gibson L-5 and Super 400 and individually built creations from John D'Angelico (about 20 minutes walk downtown), Willy Wilkanowski (a subway ride out to Greenpoint, Brooklyn) and Elmer Stromberg ( a few hours north in Boston). The Epiphone company was headed by Epaminoudas ("Epi") Stathopoulo until his death in 1943. By all accounts he was an extremely fastidious and dedicated man, who personally inspected every instrument produced. All high-end carved-top Epiphone guitars are fine instruments, and were often preferred by the era's top players to anything else available. This Deluxe carries a serial number dating it to 1946, just after WWII. This was a big production year for Epiphone, likely due to a backlog of orders held off during wartime. It is a great example of the more refined, 'perfected' swing-era Deluxe. The 5-piece laminated neck is slimmer than the older models, and feels amazingly modern. Original "E" marked enclosed Epiphone tuners and "Frequensator" two-part tailpiece are hallmarks of this period. The finish is a golden blonde natural highlighting the lovely burl maple back The sound is both rich and powerful, with the definition Epiphones are known for. We are always pleased to offer these top-line Epiphones, not only great guitars but part of the New York musical heritage. Overall length is 42 in. (106.7 cm. ), 17 1/4 in. (43.8 cm.) wide at lower bout, and 3 1/4 in. (8.3 cm.) in depth at side, taken at the end block. Scale length is 25 1/2 in. (648 mm.). Width of nut is 1 11/16 in. (43 mm.). This is a lovely well played guitar, but also obviously well cared for and has a spectacular sound in both acoustic and electric mode. It retains its original hardware including the rosewood and maple adjustable bridge, bound celluloid pickguard, Epiphone individual enclosed gold-plated tuners and gold Frequensator tailpiece. There is general wear overall, most notably most of the finish is rubbed off the back of the neck and there are some visible dings and scrapes to the top. The area of the side just below the heel shows dings that appear to be from a pinky ring, the true mark of a veteran jazz guitar! There is an old repaired grain crack to the back near the neck heel, solid but visible. There is one long (and long-ago repaired) top crack under the tailpiece, and another running from the bass side F-hole to the back rim-both solidly sealed. The Frequensator tailpiece has been repaired at the base (as most have) and is solid, but the gold plating and markings are gone. The frets are the original 40's style small wire but this is likely an old refret. Playability is excellent and this is one of the best sounding swing era guitars we have had in a long time. Includes a period (but not Epiphone-marked) brown hardshell case. Set up with a DeArmond top-of-the-line Model 1100 floating pickup, with the controls mounted to the pickguard and the jack mounted to the rim. Treat to play and see for the archtop fan, and a great sounding guitar for many styles of play. Overall Excellent - Condition.